Represent owners, architects, engineers, project managers and general contractor in successful defense of a variety of claims in litigation and arbitrations. Calfee’s Construction Litigation practice is founded on the recognition that litigation must serve business objectives – not the other way around. Our Construction Litigation attorneys recognize clients’ objectives in developing strategies to resolve business conflicts through the traditional legal process or alternative methods of dispute resolution. 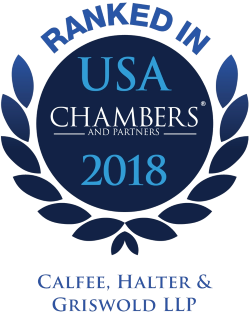 For well over a decade, Calfee's Litigation group and individual litigation attorneys have been ranked and recognized by Chambers USA: America's Leading Lawyers for Business, an industry-leading legal resource for professionals in search of qualified, experienced legal counsel. Calfee was selected for inclusion to the 2019 U.S.News – Best Lawyers "Best Law Firms" report for Construction Litigation and Construction Law (Metropolitan Cleveland rankings). Represented owners, architects, engineers, project managers and general contractor in successful defense of a variety of claims in litigation and arbitrations involving major urban office, highway, sewer and water treatment plant projects. Represented manufacturer/seller of concrete admixtures to recover purchase price from nationwide supplier in international arbitration involving multiyear sales of construction products. Represented subcontractors in multiple arbitrations, mechanic’s lien actions and a foreclosure suit involving a large downtown Cleveland retail expansion. Represented international engineering and construction firm involved in litigation with joint venture partner, insurer and project owner over design and construction of coke oven. Represented mortgagee-lenders and owners in prosecution and defense of major foreclosure proceedings involving a wide variety of large commercial structures, including office buildings, hotels and manufacturing facilities. Served as AAA, ICC, and ICDR arbitrator in domestic and international construction and infrastructure disputes. Represented multiple lenders in complex foreclosure of hotel property involving related bankruptcy and counterclaims alleging lender liability. Represented court-appointed receivers in management of large suburban office properties in foreclosure. Represented subcontractor in mechanic’s lien foreclosure action and successful resolution of claims involving construction of a skyscraper in downtown Chicago. Successfully represented a real estate management company in litigation against the United States involving the award of a General Services Administration (GSA) lease. Represented municipalities in defense of claims for delay and additional work in multi-million-dollar sewer and water improvement projects. Represented school district in defense of claims by non-performing contractor in asbestos abatement project. Negotiated favorable resolution of damage claim arising from alleged defective design and construction of curtain wall on 67-story office tower.